Attract customers from miles around with our huge 6 foot Cloud Buster! When attached to our pennant banner, it will fly 120' over your building. Each Cloud Buster requires 120 cubic feet of helium and are for one time use. 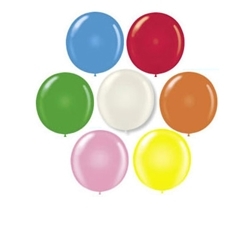 Buy the Cloud Buster balloon itself or as an all-in-one kit, ready to fill and fly!. GREAT ATTENTION GRABBERS! !